Hi everyone! My great-niece Ava had a birthday on Thursday and her party is today. She's only seven, so I wanted something cute and girly. I love this bear set, it's so cute! I colored everything with copic markers. The pink rectangle was created by putting masking tape around the perimeter of the panel and sponging pink ink on it. I added white dots on the cake as well as yellow stickles on the flames of the candles. I sprayed the panel with Shimmer Spritz. Love that stuff! I'm using it on everything! I stamped the sentiment on a banner. The pattern paper was a perfect match for the colors I chose. I hope everyone has a great New Year's Eve! Have fun! I just got this stamp set from Altenew yesterday so it was on my table ready to go. 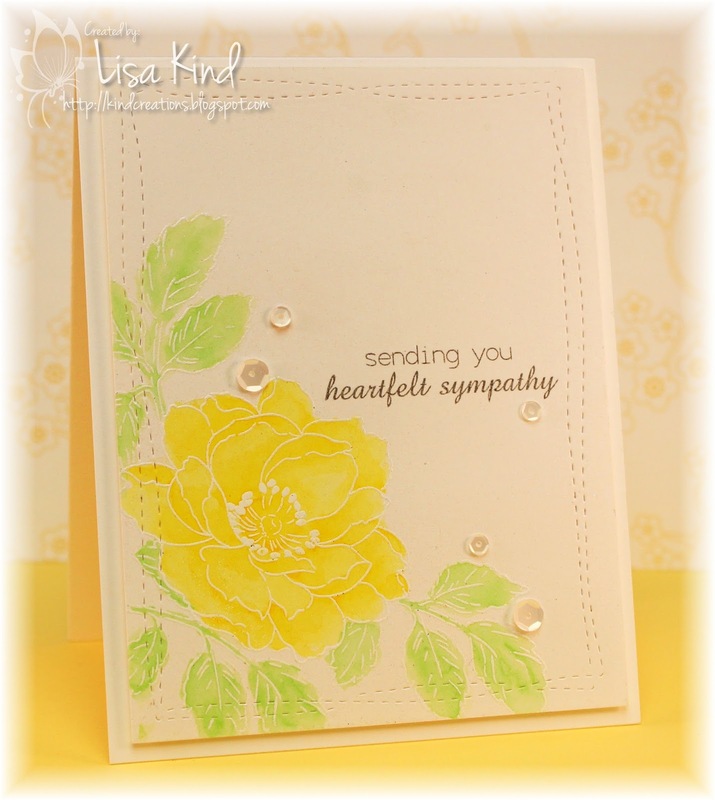 I stamped the flower on some smooth white Bristol cardstock in Versamark and embossed it in white. Then I masked it and stamped the leaves in the same way. I wanted a soft look, so I used Zig Clean Color markers very sparingly and moved the color around with a water brush. It was just the intensity I wanted. I also wanted the sentiment in a softer ink, so I used SU's smoky slate. 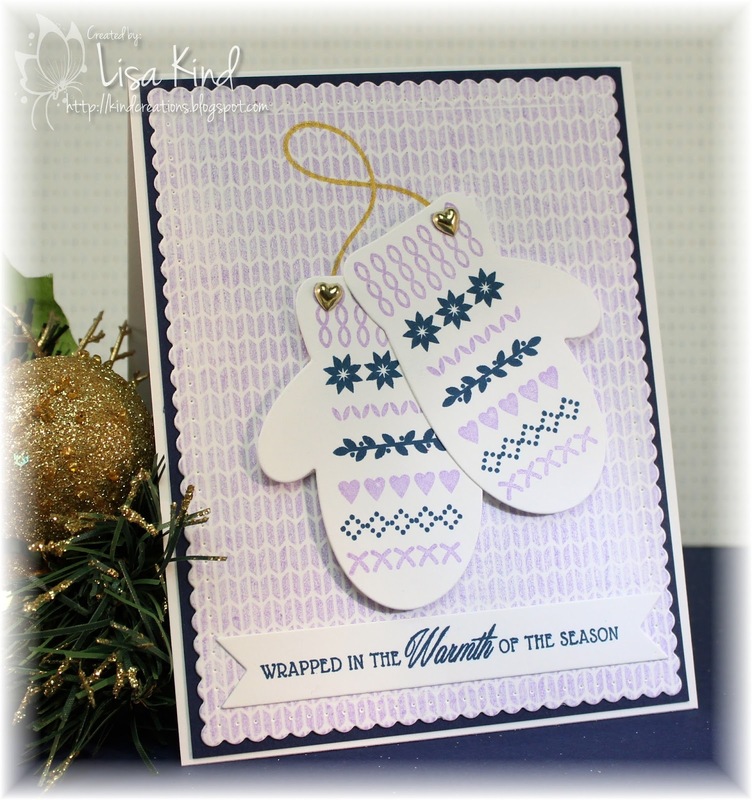 I stamped it using the MISTI and stamped it three times to get the look I wanted. I die cut the panel with a wonky stitches die and then sprayed it with Shimmer Spritz. Sequins finished it off and I attached the panel to the base with dimensional tape. 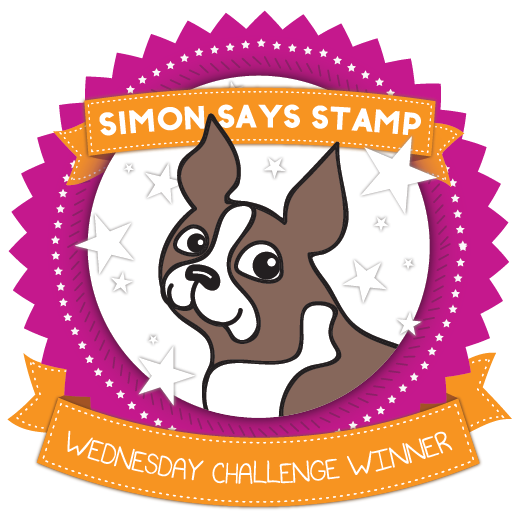 I'm entering this in the Simon Says Stamp Wednesday challenge. It's an Anything Goes challenge. With each sunrise we are given a chance for a new beginning. This quote reminded me of a picture I took last year at church on Christmas day. It was a new banner hanging beside the altar and I knew I could translate it into a card. Which is just what I did! I think it turned out pretty much as I envisioned. I started by using masking tape and sponged Wild Honey distress inks onto the white card panel. 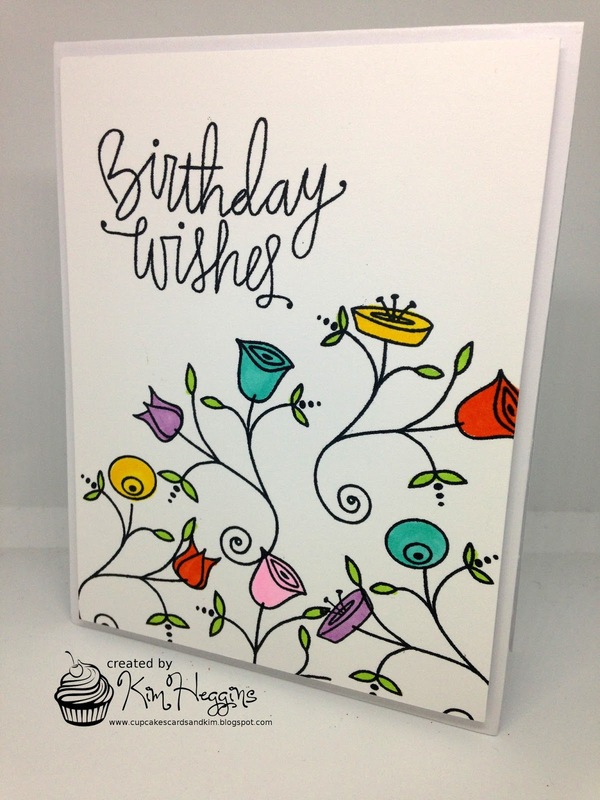 I also sponged the same ink onto some white cardstock that I die cut with some rolling hills dies. 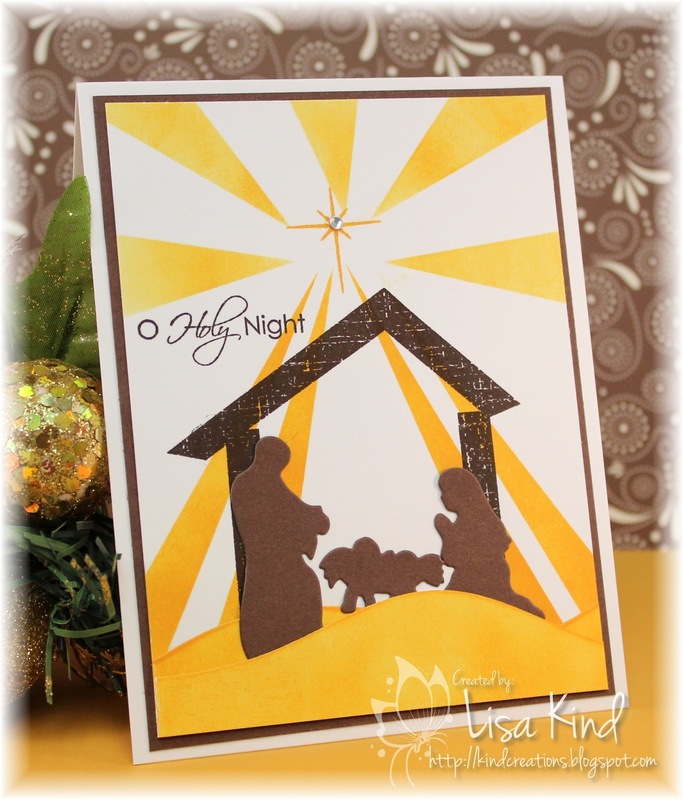 I stamped the manger in chocolate ink and die cut the silhouettes in chocolate cardstock. They were all attached to the white cardstock. 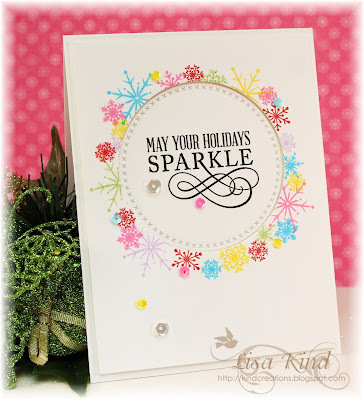 I stamped the sentiment and star and added a crystal to the center of the star. You can see more from the design team and our guest on the Time Out blog. I had to make a few thank you cards for gifts I received this Christmas. 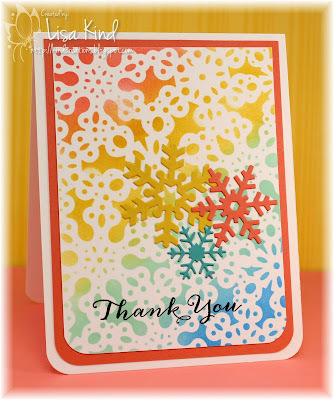 I saw this post on the Taylored Expressions blog and thought these cards were so colorful and beautiful. However, I wanted something with snowflakes. So I searched my stencils and cover plates and found one of each I could use. Here's the first card I made. I used a very intricate stencil on this card. I had to pounce the ink onto the cardstock for fear of breaking the delicate parts of the stencil. I wanted to use white snowflakes, but they sort of got lost on the panel. So I used colored cardstock to match some of the inks. These took much longer than I anticipated because of the intricacies of the stencil and die, but I enjoyed the time making them. Hi friends! I hope you had a Merry Christmas if you celebrate this wonderful holiday! We had a nice time visiting family and a few friends as well! I had to make a few last minute Christmas cards and I'm just getting around to posting them, well one actually. I made about six of these! I made this same card last February or March as a birthday card, and at that time thought it would make a great Christmas card. So I took that design and did just that! 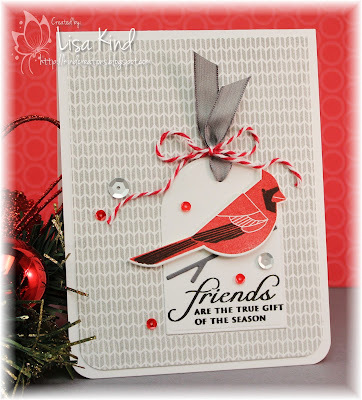 I started with the background stamp and stamped it in gray ink. Then I went to work on the cardinal. I die cut it first, then stamped it in red and black inks. I die cut a tag, attached the gray branch (which was also die cut) and stamped the sentiment. I added the ribbon and twine and then the bird with dimensional tape. The tag was attached to the base and I added some sequins to finish it off. Hi everyone! 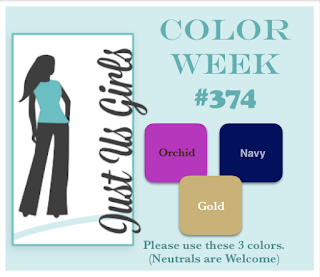 I'm the hostess for this week's Color Week Challenge over at Just Us Girls. I saw these colors on a colleague's dress and thought it was very interesting. I've been wanting to use these mittens from My Favorite Things. I don't see them on there site, so I'm assuming they are discontinued. Funny that they are discontinued and this is the first time I'm using them! My motto: Too many stamps/dies, not enough time! You can see more from the JUGs design team and our guest, Teresa, on the JUGs blog. This is Teresa's last week with us. We loved her creations! As a note, the JUGs blog is taking a much needed break for the holidays. We will be back with new challenges on Saturday, January 7, 2017. Hey everyone! 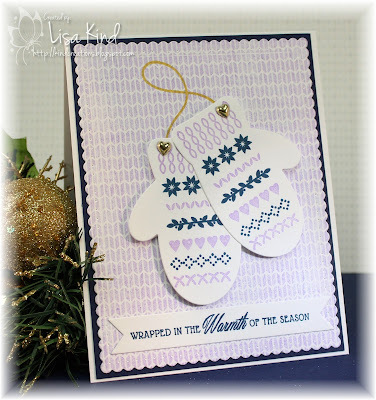 How are you all doing with your Christmas shopping, decorating, and card making? I'm almost done shopping, decorating is happening this weekend (we got our tree yesterday), but I'm far behind on my Christmas card making! But I've got one today for the Just Us Girls Trend challenge. 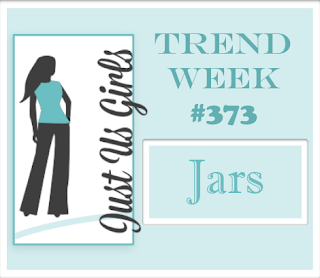 The trend this week is JARS. Of course I had to pull out the Friendship Jar stamps and dies. 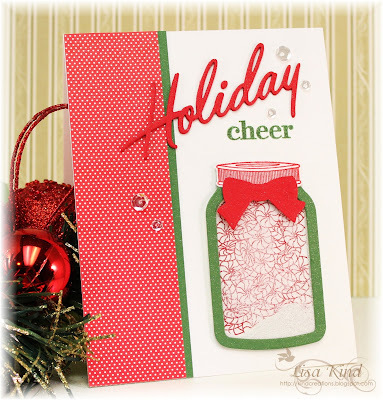 I die cut the jar to make a shaker card. I stamped the peppermint candies (I stamped them in red, but didn't color them in) and added some glitter for the shaker bits. The word die was die cut three times and stacked. I added that bow at the last minute...it needed something to spiff it up a bit! I spritzed the entire card with Shimmer Spritz...it really sparkles! Sequins, of course! 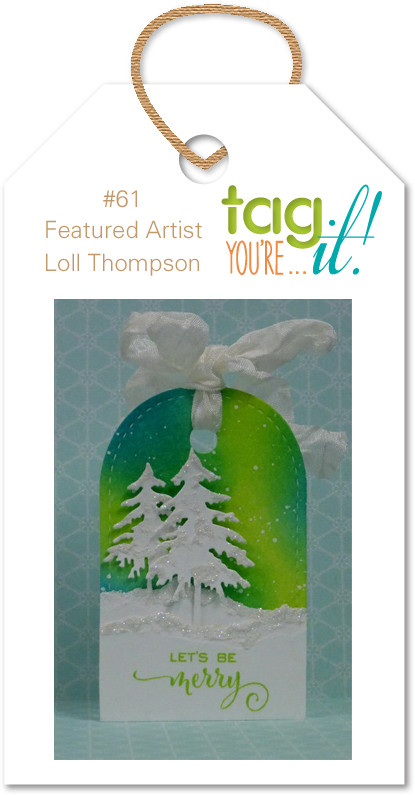 You can see more from the JUGs design team and our December guest on the JUGs blog. Hi everyone! It's time for a new Time Out Challenge and this time we are CASE-ing a card. 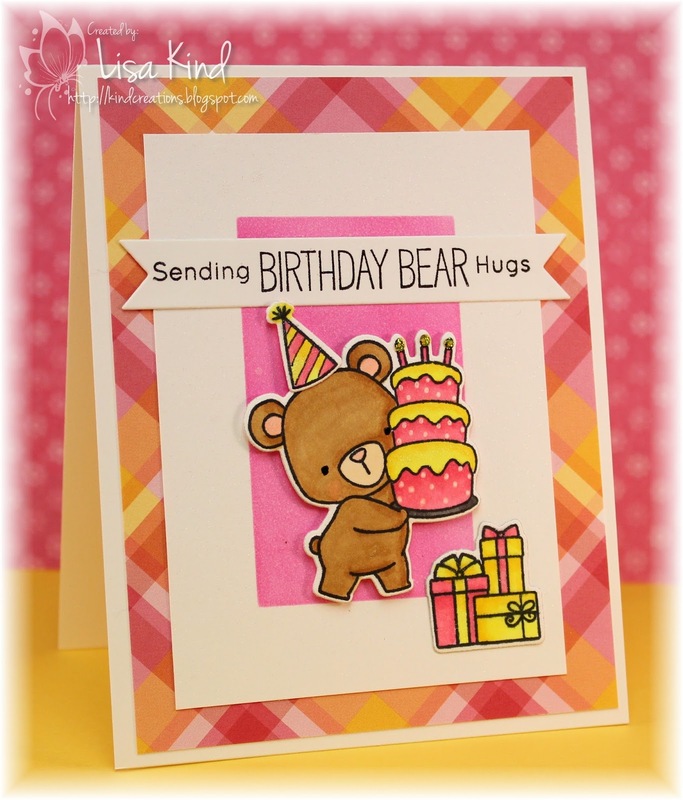 This is the lovely card by Kim that we are case-ing for this challenge. And this is my take on the challenge. I have to admit that I got this idea for this layout from another blog, however I do not know whose blog! The idea just stuck in my head. 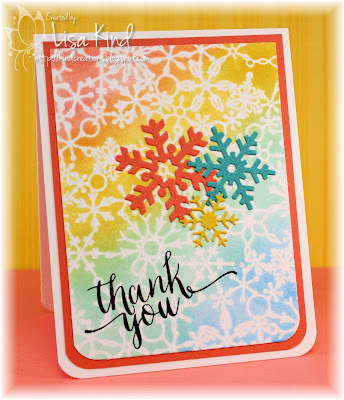 I drew a circle with the die, then pulled out all the stamp sets with snowflake stamps and chose four or five of them in various sized to use. I started with the largest one then worked my way around with the different colored inks. I used similar colors that are in the challenge card. Then I die cut the circle and mounted the stamped piece onto the base using dimensional tape. I die cut another circle from a scrap piece of white cardstock, stamped the sentiment on it and adhered it in the opening. I added sequins and some shimmer to the snowflakes with a spectrum noir pen. You can see more from the Time Out design team and our guest for this challenge, Deepti, on the Time Out blog. Hi friends! I needed a baby girl card for a friend who is expecting right before Christmas. I wanted to do some copic coloring, but that wasn't working for me last night. Next choice was watercoloring a background. 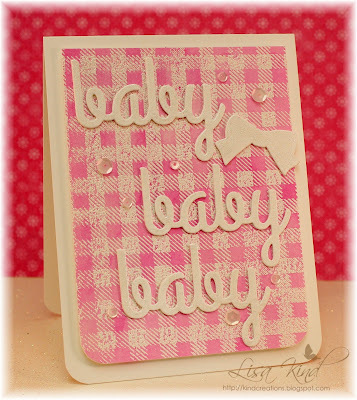 I first embossed this gingham background stamp with white embossing powder on watercolor paper, then used some distress ink and watercolored over it. I settled on just die cuts for the rest of the card. It was getting late and I was running out of ideas! Each one is stacked with three layers of cardstock and shimmered with a spectrum noir pen. The bow was done in the same manner. I added sequins (of course!) and rounded the corners. I should be making more Christmas cards! I need quite a few and only have about five! One will be posted on Thursday for the Time Out challenge. Hope to see you then! 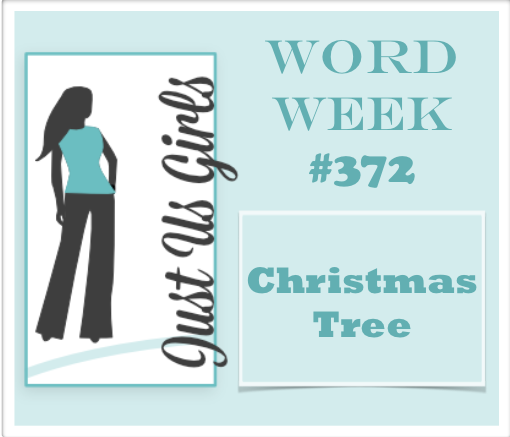 It's Word Week over at Just Us Girls and Nancy chose an appropriate one for this time of year...Christmas Tree. An easy one, but the tough thing was which Christmas tree do I use from my stamp and die collection? THAT was a tough one! 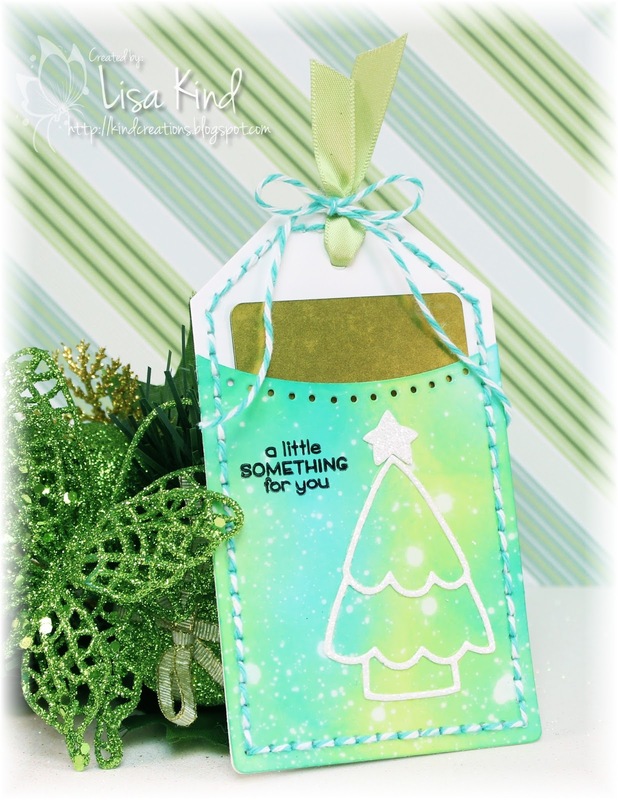 I settled on this tree die from Paper Smooches. I die cut it from white glitter paper. I also wanted to make a tag to play along in the Tag You're It challenge. 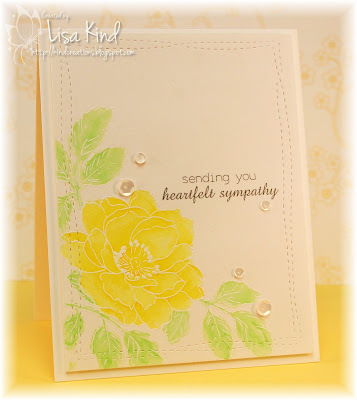 I used a piece of Distress Specialty Stamping paper and sponged Twisted Citron and Peacock Feathers on it. Then I spritzed it with water. I love how it looks like snow falling or even lights glimmering. I stitched the parts of the tag together with twine and added the sentiment. I tied it off with satin ribbon and more twine. Here's the link to the Tag You're It challenge.